Home / Ankle Holsters / Ankle Concealment Holster. Concealed Carry with Comfort. 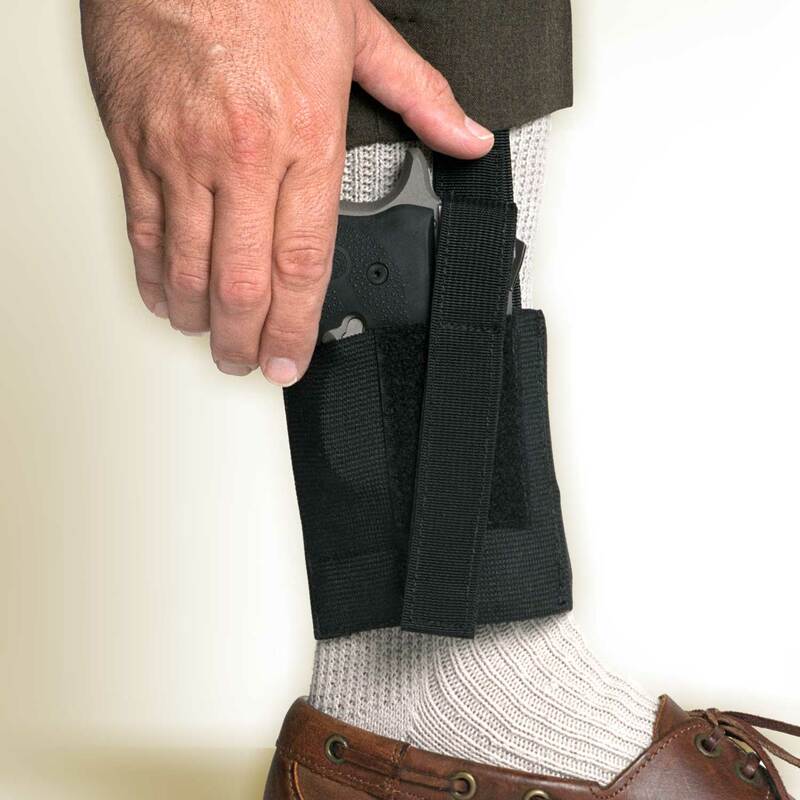 Ankle Concealment Holster: Super concealment and comfort. You’ll forget it’s there – until you need it. Serious about your protection? 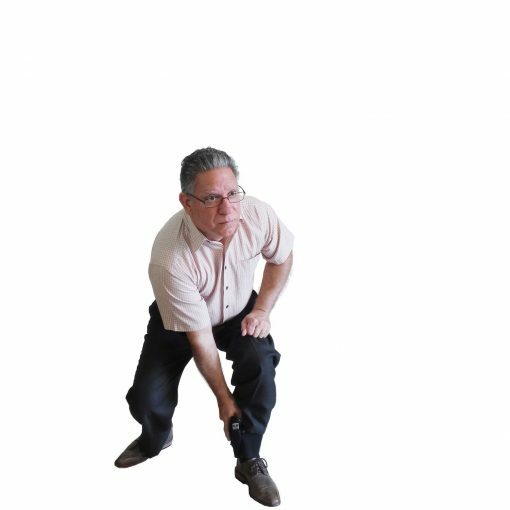 Then an ankle holster is one of the best carry options if you want immediate access to your gun when sitting, either while driving or behind a desk! 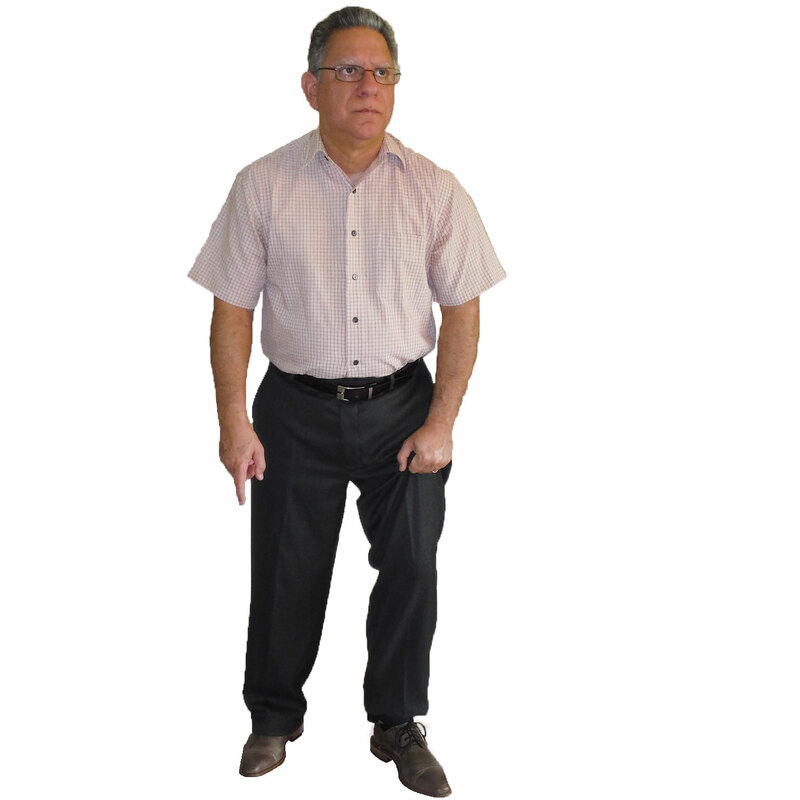 Or if you are in a work environment where someone might accidentally bump into you and discover that you are carrying, (on the belt, pocket or shoulder carry), the ankle carry may well be your only option. It is also an excellent place for a backup gun. Amazingly comfortable, the ankle concealment holster’s lightweight design gives you superior mobility with excellent concealability. Nothing shows on the outside. Superb wraparound design holds gun snugly around your ankle for maximum concealment and prevents chafing. The Ankle Concealment Holster is a quality holster designed for no-nonsense, practical everyday use. Effectively carry, completely concealed, small to medium pistols and small frame double-action snub-nose revolvers. 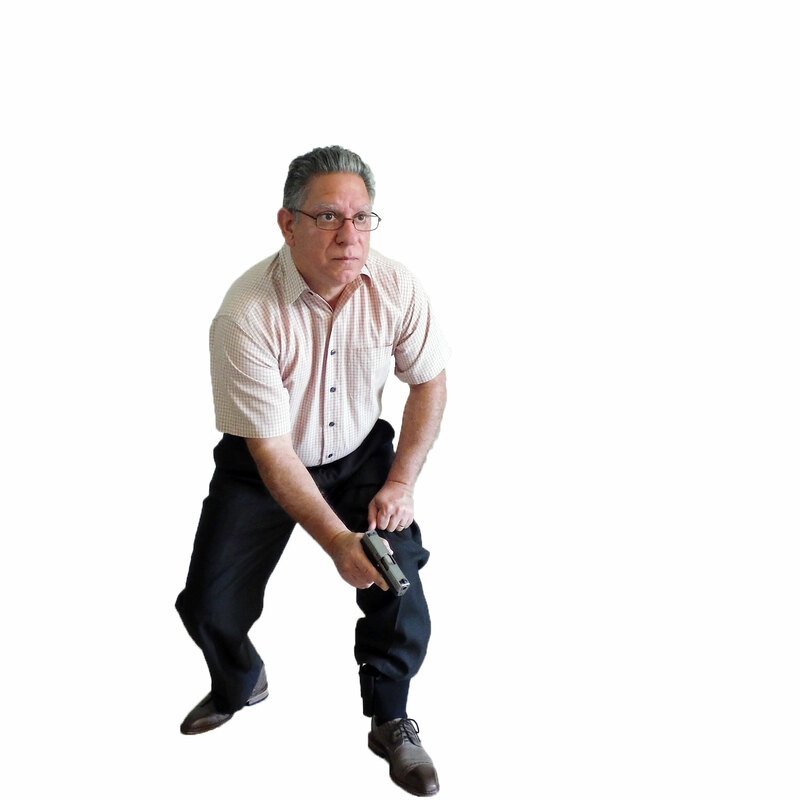 You have immediate access to your gun. Allows for a smooth, fast draw. 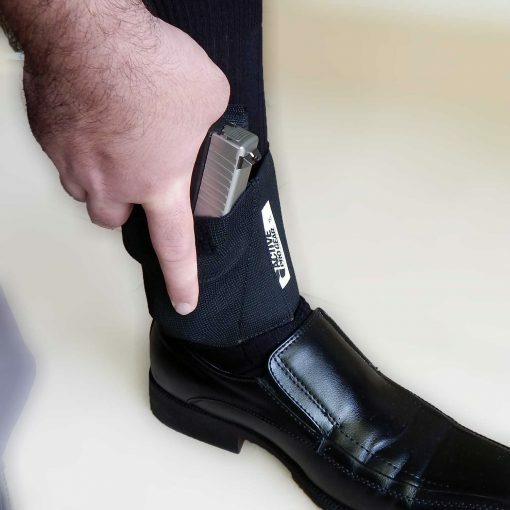 Holster secures around the ankle and is made of soft, long-lasting elastic and Velcro® for maximum concealability and padded for comfortable extended, All-Day wear. The closed-cell foam padding also protects your gun from perspiration. Includes a retention strap that secures your gun in the holster. Also available is an optional removable and adjustable thumb break for quick, easy access and to keep your gun secure. They are made with high-quality snaps and steel reinforced to ensure a quick and precise release every time. 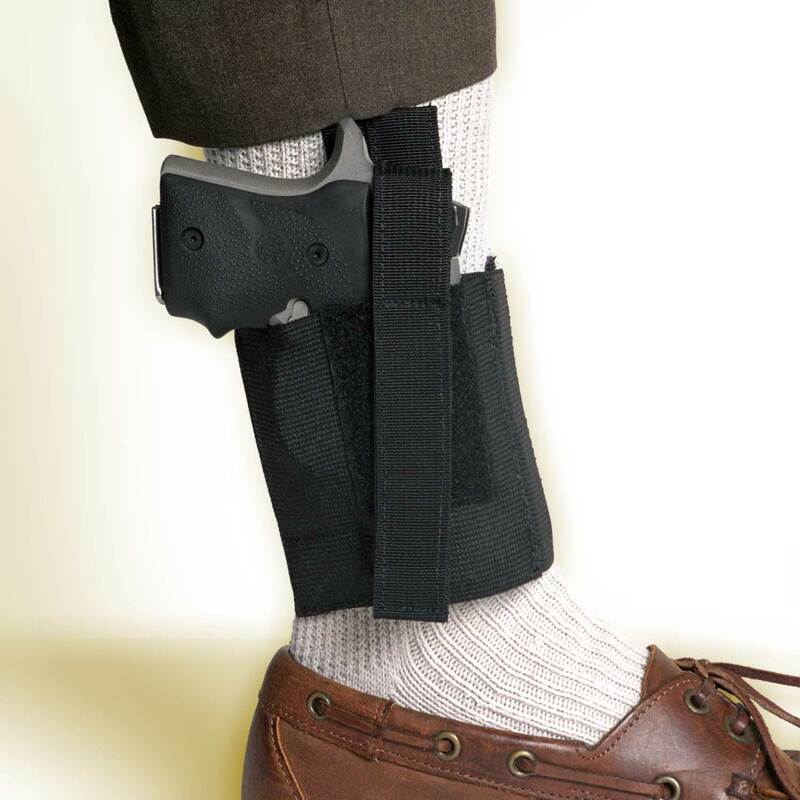 Includes removable calf strap that adjusts for height and diameter to prevent your gun from sliding down. Right hand and left hand draw models available. Open muzzle design accommodates multi guns with different barrel lengths. It will solve your concealment needs for several guns at one low price, saving you money. Made from premium USA-Made breathable elastic and Velcro for extreme concealability. This special lightweight, long-lasting elastic has a unique plush finish on one side so it feels like velvet on your skin for a comfortable, all-day carry. You’ll forget you’re carrying a gun! We use only the finest bonded nylon thread and all stress points are double stitched for extra strength and durability. Right and left-hand draw models available. 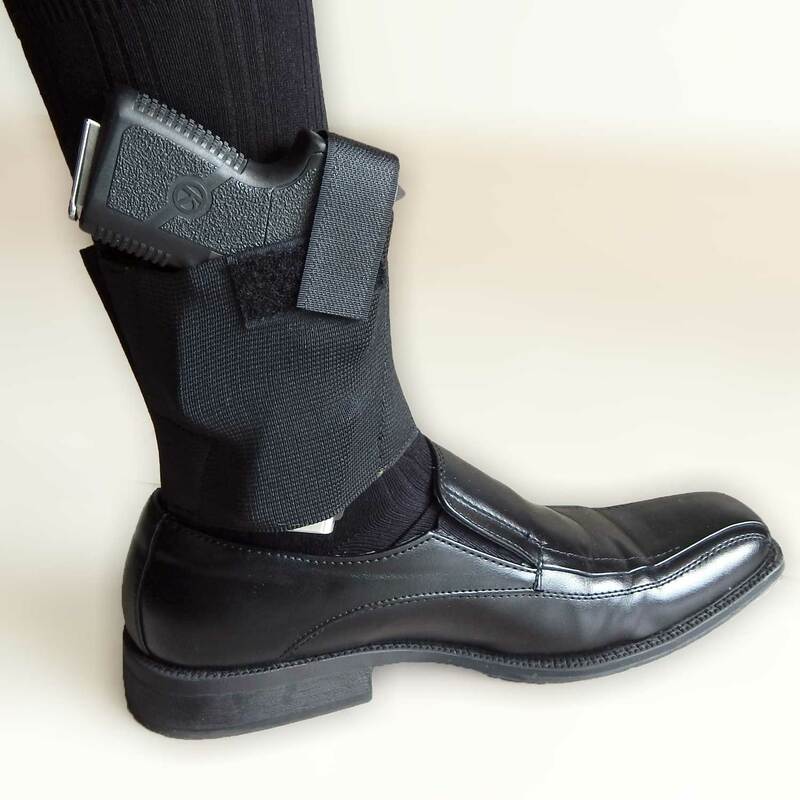 The Ankle Concealment Holster is designed to be worn on the inside of your ankle on the opposite leg from your strong hand. Right-hand draw holsters are attached on the inside of the left ankle. Notice: This holster is designed for maximum concealment, and is NOT intended for one-handed re-holstering and should not be used for such applications. The Self-Defense Guideline Card! The seven steps you must take to keep you from going to prison if you ever have to use your gun in self-defense. This card reveals, step-by-step, exactly what to do after the confrontation ends and the confusion begins. It contains vital information to protect you! If you carry a gun for protection, you can’t afford to be without this card. Get your card absolutely free, just by trying the ankle concealment holster—at no risk to you! Better together. Check out the Ankle Magazine/Tool Carrier, Ankle Safe and Thumb Break. 5.0 out of 5 stars B.M. Favorite ankle holster. Just as described on line. LCR9 fits fine. 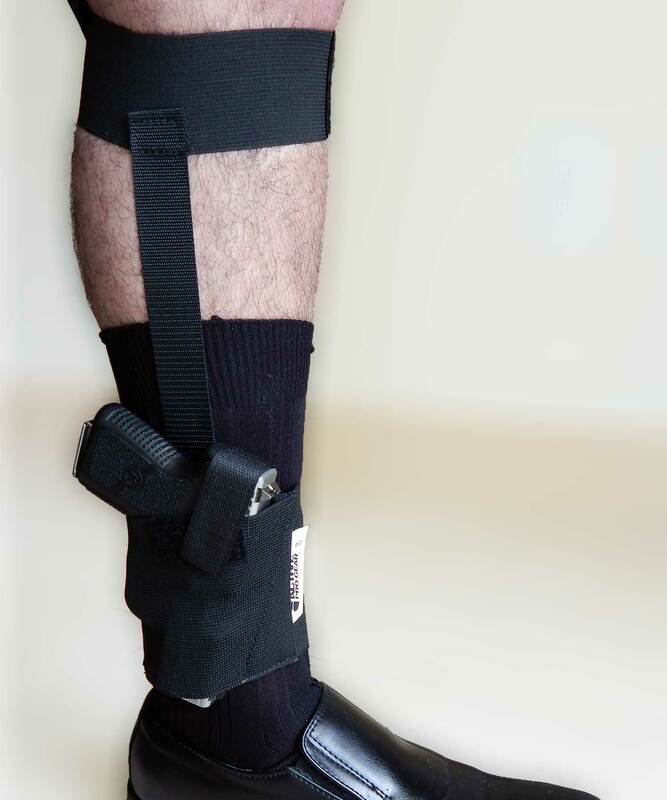 Removable calf support strap is good feature and part of reason I chose this over others. 5.0 out of 5 stars S.P. Fits true to size comfortable. Great deal. 5.0 out of 5 stars T.M. It's comfortable and does the job. I wear this on my ankle with a LCP 380. 5.0 out of 5 stars B.H. I love it. It works great for the Sig 380. I can't hardly notice it is on my ankle. No one can tell I have it on. 4.0 out of 5 stars R.L. Ordered one of each size, small and medium and did not notice any makings on the bags to differentiate the sizes and both pieces of cardboard said model 258, so checked both and noticed the difference in slot and stitching. The small would be the 258K and the medium would be just 258. The small 258K works well with small compact pistols such as the Sig 380 and similar models. I was able to walk around with a Sig 380 in the 258k that made almost no sound, I was able to do this with the safety velcro attached and not attached. The pistol did not come out of the slot even when not using the safety velcro. The medium 258 would work well for sub compacts such as Beretta PX4 and similar models. The biggest con with all these hidden velcro holsters is the sound the velcro makes if you wanted to the pistol without making any noise/sounds from your location. 4.0 out of 5 stars R.W. This is the best of the ankle holsters for comfort, and security with the thumb release. This is the best of the ones that I have tried. I do not seem to need the extra strap to hold it in place. (It is an accessory for this one). I read that the snap can hurt your skin and so I added a piece of gauze tape to the inside of the snap and that took care of that. And that is the only reason for dropping a star on the rating. 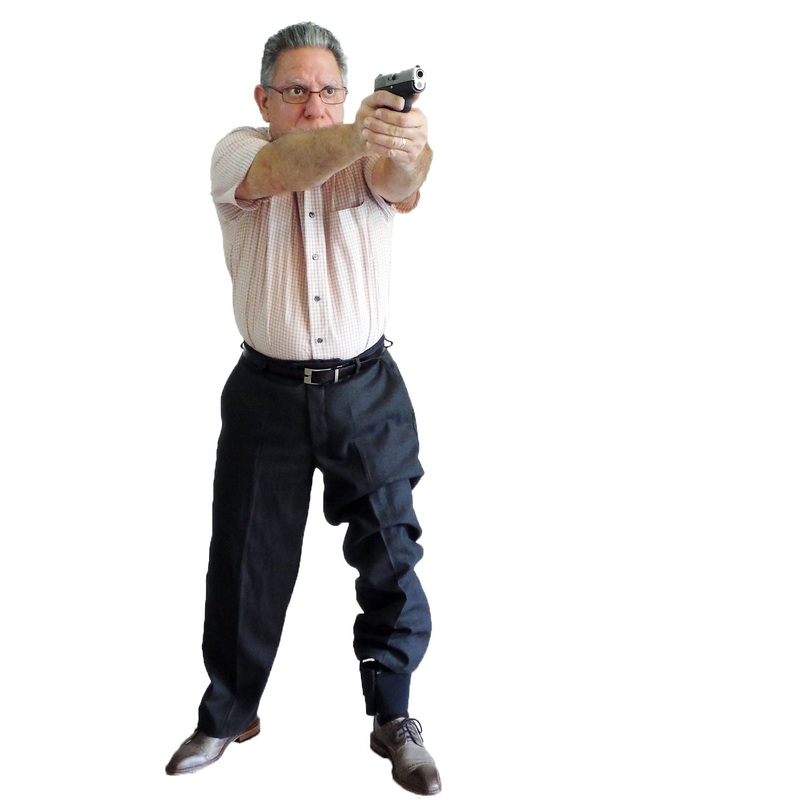 5 reviews for Ankle Concealment Holster. Concealed Carry with Comfort. So comfortable I forget I have it on.. I would recommend this holster to anyone that wants comfort and easy to get to. This holster is a bargain for $20. Carry my backup .380 perfectly in this holster. Fairly comfortable holster at a great price. I ordered the optional thumb break and I’m finding that the strap is too long on the outside and it’s curling up and catching on my trousers.